Intended use: Running - stability, pronation control. 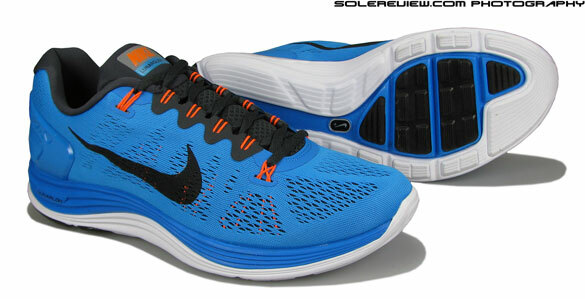 Midsole: Injection molded EVA variant (Nike Lunarlon), with dual density units interlocked together. The 2013 Lunarglide 5 builds on what already was a great shoe, with evolutionary updates like the new lacing system, front and rear reflectivity and re-engineered single layer mesh. At the same time, the Lunarglide 5 still carries over 85%+ of Lunarglide 4's parts, so if you're currently on the LG4, you might want to wait another year to move up. If you're a new Lunarglide user, this shoe will check all the right boxes, be it cushioning, ventilated upper, weight and overall ride. Nike did a fine job on the Lunarglide 4 last year with a 100% makeover. New outsole-midsole construction, radical upper design, the works. It would be unfair to expect a shoe with all around updates just after a year, but still, the 2013 Lunarglide 5 gets some much needed mods on the upper by way of small, yet evolutionary changes. With the Lunarglide 4 already being a well rounded platform, these small tweaks have turned the Lunarglide 5 into a better shoe than its predecessor. And what has changed, you may ask? To start off, we’ll go over what hasn’t changed. The sole unit, with its interlocked combination of soft and firm foam carries over from the Lunarglide 4 sans updates. Which means the performance is as good as last year’s version – heel and midfoot strikers with neutral gait will find the resilient cushioning adequate; and mild overpronators will find the support of the firmer midsole foam on the arch side welcome. At the base, the pieces of rubber outsole form a line of defense between the tarmac and the midsole foam, in addition to providing grip and durability. Last year, we had some concerns about the durability of the sole, but those fears have proved unfounded. We’ve got a year behind of running in the Lunarglide 4, and we’ve not encountered any durability issues which will concern runners. However, we’d like to point out that factors like body weight or hot weather will have an effect on the life of the outsole. After long term testing of the Lunarglide 4, we’d like to call out that we think favorably of the outsole construction of the Lunarglide 4 (and hence, 5). With multiple rubber pieces mounted in isolation on different areas of the midsole, the resulting ride is adaptive, and also cushioned. Let us explain. Traditional outsole designs tend to have a larger pieces of rubber covering the midsole foam, so with every footstrike, midsole compression happens in a larger area relative to the point of impact. Not so with isolated outsole rubber ‘pods’. The force of the impact is absorbed by the isolated rubber pods beneath, resulting in overall stability. Cushioning behavior is affected too – rubber pods retract inwards into the soft foam with each footstrike, padding the impact more effectively. Reminds us of the Tempurpedic ‘wine glass’ commercial, where they keep a glass of wine on the mattress and then jump around on the same mattress and the wine doesn’t spill. A few miles on the Lunarglide 5, and we realized that the overall fit and feel is more or less like the LG4, and with good reason. Similar materials are used throughout, and since the updates are not major, it does not change the way the shoe behaves overall. But having said that, there are a few differences – some functional, and some purely aesthetic. 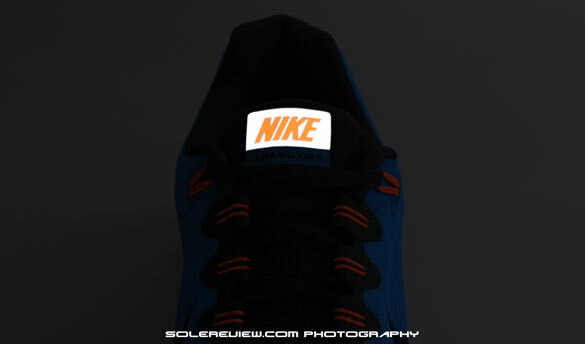 The noticeable update is the lacing mechanism in the Lunarglide 5, which improves from where the Lunarglide 4 left off. In the latter, ‘Flywire’ cords extended upwards to directly loop through the laces. This mechanism, while achieving its goal of a tight midfoot fit in the first few weeks, lost its edge in the long run. With time, the cords would expand slightly so a tug on the laces would not result in the original level of midfoot lockdown. 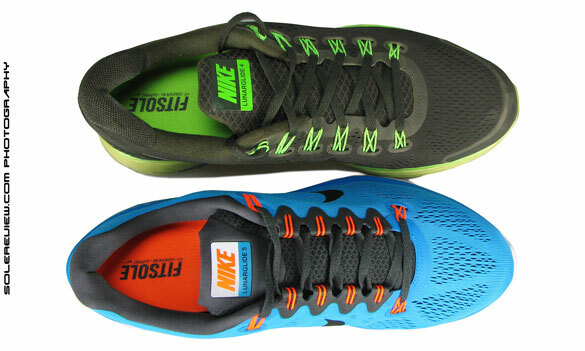 With the Lunarglide 5, Nike seems to have rectified that to some degree – now, all the loops (except the front and back ones) start at the top of the upper ( attached to the lacing loops) and extend downwards, having formed a loop for the laces to pass through. 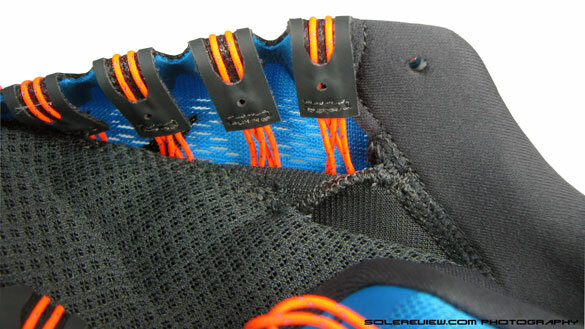 So if you tug hard on the laces, it pulls both on the outer layer of the mesh upper and the Flywire cords. Going by our first impression, it results in a uniform midfoot pressure without any tight spots. This is somewhat similar to last year’s Nike Free Run 3, but only long term testing will decide whether this system performs as well as it looks. Figure A and the following pictures recaps the changes on the Flywire fastening system. 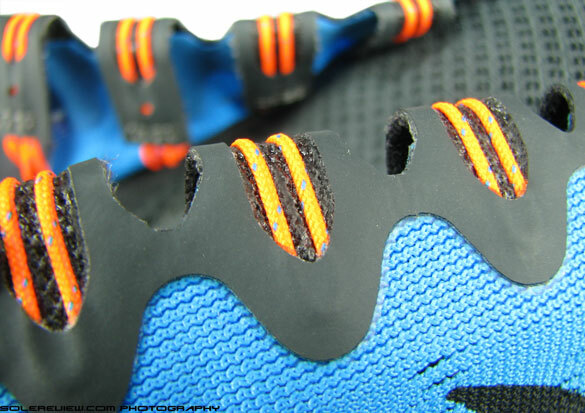 But we would have still liked to see the front Flywire loop go – applying pressure on the laces ends up making the forefoot area tighter than necessary, and some runners might not appreciate that, specially people who have wide feet. The Flywire cables now integrate with the upper instead of being separate elements. This improves the quality of lacing pressure. 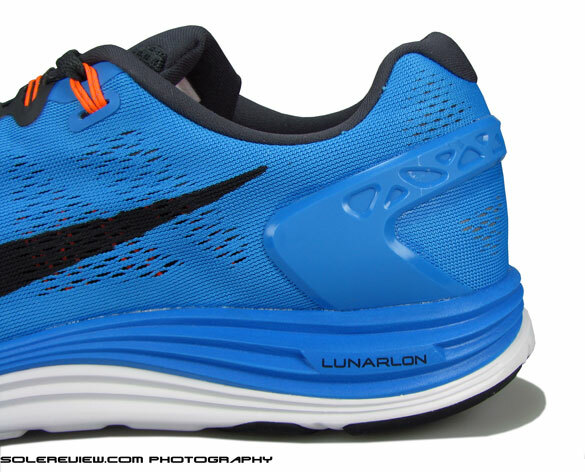 Last year’s Lunarglide 4 had reflective side Swoosh logos, but lacked front and rear reflectivity. This year Nike has made amends by removing the reflective Swoosh, but making the tongue tab and heel counter shine in the dark (see images below). Way more practical than reflective side logos. 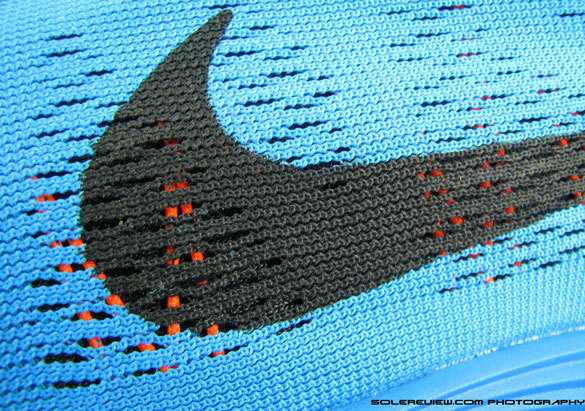 While we’re on the topic of the Swoosh logo, it has moved forward, and instead of a fused overlay on the mesh, it is simply printed on the mesh, making that area breathable and lightweight. The mesh remains single piece and single layer, though this year’s Lunarglide has an engineered knit construction in the toe box, combining closely knit+perforated mesh structure to allow for both strength and ventilation. The toe bumper, which till last year was a separate material fused on the upper and has now disappeared beneath the mesh. This gives the entire mesh upper a seamless look (which it is, actually) mimicking its Flyknit cousins. Lastly, the plastic heel clip goes through some cosmetic changes, with the inclusion of recessed triangular patterns in its molded shape. But it has no influence on the fit, and does the same job as last year’s heel counter. 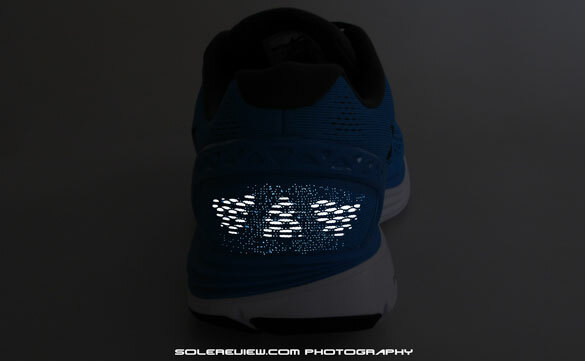 Tongue top label has night time reflectivity. Shine a light on the heel, and its shines back! Engineered mesh, and an invisible toe bumper underneath which gives shape to the toe box. There is one area which is bit of a let down, that is the collar area. 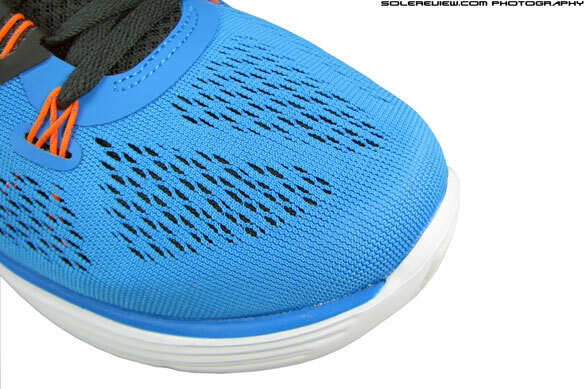 The Lunarglide 4 had this soft, suede like mesh on back of the tongue, and around the collar lining. When combined with the softer mesh around the Achilles area, it felt great around the ankles. The Lunarglide 5 has none of that, and the tongue and collar region is swathed in a singular type of tightly woven mesh, which brings down the plush feel by a few notches. It is a pity, considering that the LG5 improved in a few areas where LG4 sorely lacked finesse. 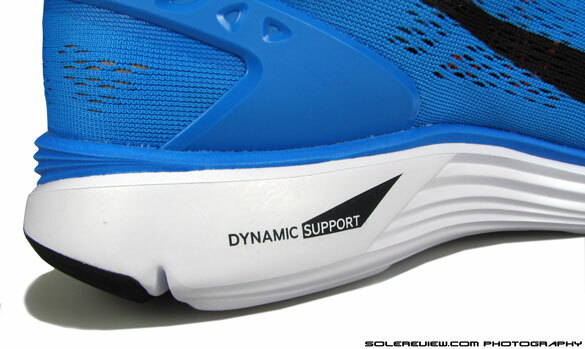 There is another element of detail which has been stripped away in this year’s Lunarglide. Last year, the laces had beautiful tips, with the ends encased in silver colored metal, but this year the laces have switched back to regular plastic tips (Aglets). Small details do matter. We were surprised to find out that the Lunarglide 5 is 10 grams heavier than the last year’s model. There seems to be no apparent reason, and we are weighing the same shoe (same size) on the precision scale we’ve had for years. We’ll be back with a reason if we find one. 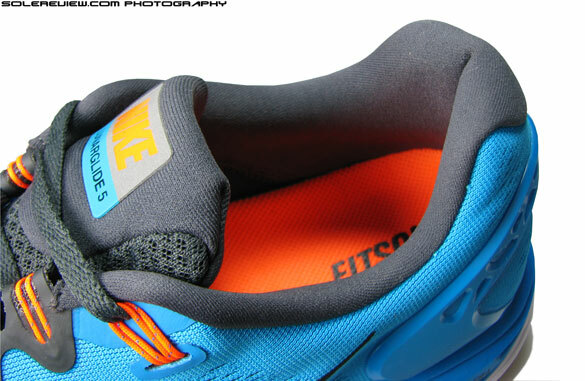 The collar foam felt plusher in the 2012 Nike Lunarglide 4. The sockliner hasn’t changed, same Ortholite foam doing cushioning duties under your foot. It retains the horizontal toe to heel ridges which helps wrap around the foot, and arch support is where Lunarglide 4 left off – adequate for most runner profiles. As the updates are not massive, there isn’t much more to write about. We’ll leave you with what we think sums up the shoe well. If you already have a Lunarglide 4 and are planning to upgrade to LG5, we’d say that you don’t do so till you see the Lunarglide 6 on July 10th, 2014. On the other hand, if you haven’t had a chance to try the LG4 yet, we recommend that you give these a try. The Lunarglide 5 will make most runners happy, with its cushioned ride, superb fit and a well ventilated upper.